Dilido House, Miami, Florida. SAOTA. “The setting for this Miami house is on a pie shaped lot on the southern tip of Dilido Island with superb views of the islands, downtown and South Beach. 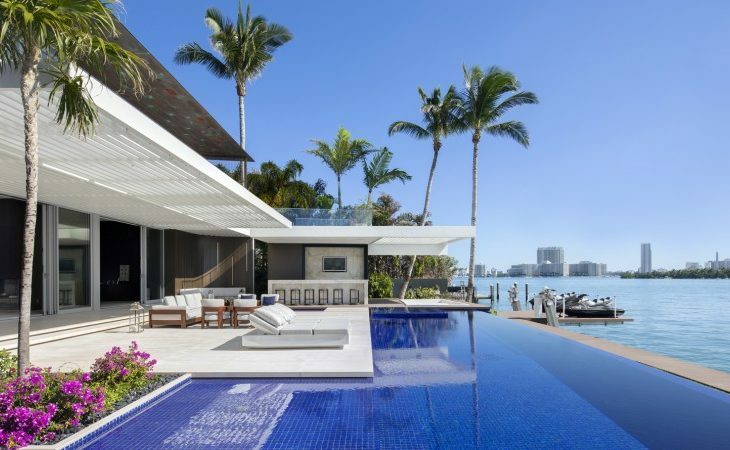 The SAOTA-designed house spills out onto the longer, waterfront elevation and draws on the jet-set lifestyle of Biscayne Bay, to evoke the experience of being on the deck of a super yacht. Multiple events unfold on this versatile terrace whose defining characteristic – the harmonious merging of internal and external living spaces – is a theme carried throughout the house. Entrance from the street, via the Venetian Causeway, is more restrained; lush planting skirts a generous in-out driveway, and a series of wall planes and volumes, held together by a curved screen of etched glass, signal a grand, double-volume entrance hall. Once inside, the splayed nature of the site becomes apparent as masses of programme pull apart to form a dramatic canyon whose volume frames the view out into the bay. This central void is animated with deliberately sculptural elements and artworks – including a bold spiral staircase, and a series of bronze screens which hang from the ceiling to create a double height dining room, and separate kitchen and family space from the more formal entertainment areas to the East. All the principle living spaces- from the more intimate areas housing a kitchen, butler kitchen and a large family den, to the more open and expansive Great Room and Study- live out onto a semi covered collection of external living rooms verged by the curved arc of the bay-side. Reflecting the lush setting of sea and islands, water, which meanders throughout the house from a pond at the entrance and via a calm refection pool around the study, unifies this lido-like outdoor space, whilst creating smaller islands of space and linking the inside to the pool and the sea. The covered external living areas flow onto a spacious deck with a resort-like choice of covered lounging areas, deckchairs for sunbathing, shallow-water “martini” seating, a fully functional bar area and even a pop-up outdoor table on the water edge for the ultimate on-water dining experience. With two mooring docks the flow between land and sea is seamless and fluid, while meeting all flood line requirements. Given the extensive space required in the client’s brief, a balance between scale and intimacy was achieved by composing the programme both between the two fractured wings on either side of the central core and across the upper and lower floors. The upper bedroom level houses the sea-facing master suite complete with hot tub and pool, and three on-the-water suites created for the owner’s three daughters. This upper level hovers between the more substantial masses of the living level and a spectacular pre-oxidised copper roof which, in a deliberate nod to the surrounding early 20th century Italianate vernacular, traces an unmistakable raked silhouette from crisp thin edge to sharp pitch. Set into this element the roof top terrace – accessed by elevator – has a second bar, a fire pit, and a hot tub with breath taking views of Downtown Miami, especially at night. The materials are subtle yet rich in their collective application with an almost yacht-like tautness which allows the home to expertly meet all hurricane code requirements, whilst remaining graceful, open and expansive. Crisp white stucco, warm grey limestone, copper and bronze detail elements combine to suggest understated luxury and textural tension. This domestic palate is offset against cobalt blue pools and lush, vivid green landscapes resulting in a grounded, sophisticated and yet relaxed aesthetic that is both cutting edge and unmistakably at home in its Biscayne Bay setting.